There is advocacy journalism and there is Citizen Koch. When the director's statement ends with "This is not the country we want to live in" you're not going to get a measured look at pros and cons of corporate funding of the Tea Party Movement featuring billionaire brothers David and Charles Koch. 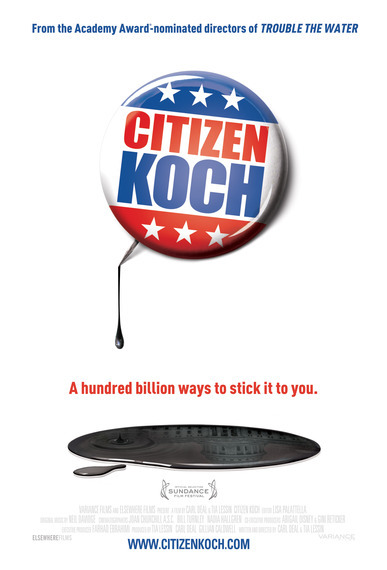 The documentary premieres at New York's IFC Theater June 6 and begins with the controversial 2010 Supreme Court case Citizens United v. Federal Election Commission that essentially equated corporations with individuals when it comes to political campaign funding, increased the influence of money on elections and in turn helped launch the Tea Party. The film then follows the age-old Watergate lesson -- follow the money -- and traces both the billionaire Koch brothers' efforts to finance a number of advocacy groups including Americans For Prosperity which in turn funded Wisconsin Governor Scott Walker's successful campaign to bust the state workers' unions. It's no accident that the film feels like a Michael Moore film with a strong working class perspective and take-no-prisoners vilification of the enemy -- co-directors/producers Carl Deal and Tia Lesson also worked on Fahrenheit 9/11 and Bowling for Columbine. The opening is a Jon Stewart-like set piece of clips of angry people saying idiotic things with a great funky sound track and Sarah Palin screaming to crazed fans at a Madison, Wisconsin rally. Charles Koch looks like a sort of venal Henry Fonda and there's lots of focusing on Scott Walker's twitchy eye. Our family likes to turn down the sound on any cable news show and try to tell just by looking at the talking head if the person was liberal or conservative. This film is virtual primer for the game -- the bad guys are creepy, sweaty, and seemingly fueled by hate, the good guys are wholesome, sincere and speak the truth. This is exemplified by a sort of side show that follows the quixotically doomed campaign of Buddy Roemer who seems to speak only in fabulous, folksy sound bites along the lines of "The politicians don't run the country, the major corporations do" and "If you have a big check you stand first in line"
The film was made several years ago and since that time each side of this David and Goliath tale has taken a hit -- last year after pressure from the Kochs PBS pulled the film and $150,000 in funding that had been promised but the filmmakers promptly went to Kickstarter and ended up with more money than they'd expected from public television. And despite the decline of the Tea Party, the Koch brothers are still going strong although there are already indications that being a moving target when it comes to funding of conservative causes may not be the way to go in 2016. Politically active nonprofit groups whose tax exempt statuses keeps donor lists private are on the rise. As told to the Washington Post by a Republican operative, "We've heard from donors that they don't want to get 'Koched.'" Koched indeed. Watch this documentary and enjoy the trench warfare. Nancy Doyle Palmer: Is Citizen Koch advocacy journalism, or is it war? Tia Lessin: It's a war movie. NDP: In the end did the controversy involving the Koch brothers and ITVS rescinding financial support for Citizen Koch that sent you to Kickstarter actually help the film and your message? TA: We suspect that losing the largest television audience for documentaries is never good for a film, and there is no doubt more eyes would have been on "Citizen Koch" had the public been able to see it on public TV. The fact that one of our most trusted institutions, public television, can be swayed by the power and influence of a billionaire donor, is deeply troubling, and we never saw it coming. If Koch money can corrupt PBS, what can't it corrupt? The response of the "crowd" funding the finishing of "Citizen Koch" shows that thousands of small donors, collectively, can counter the big money deployed by billionaires like the Kochs. That's exactly why they are working so hard to neutralize small-dollar donors in the political process -- there are roughly 400 billionaires in the US, and they know they're outnumbered. NDP: Do you think this film and other efforts exposing the financial backing of the Tea Party contributed to its weakened state today and even more secrecy from corporate donors? TA: The Kochs, through the Tea Party, have successfully mainstreamed their extreme right wing ideology and hijacked the Republican Party. That's not our opinion, that's the opinion of the lifelong Republicans we featured in the film -- a nurse, a banker, a corrections officer and a school teacher. Ideological corporations like the Kochs' Americans for Prosperity, give cover to other corporations that want to hide their political spending from consumers. It's a big money laundering operation and it's entirely legal. NDP: Has there been any specific or noteworthy reaction from the Koch brothers or any of their organizations to the film? TA: We've reserved seats for Charles and David Koch at every show at the IFC Center this weekend, and we look forward to their reviews.